Hometown: Newton, New Jersey, U.S.
Died: July 13, 2008 in Operation Iraqi Freedom. 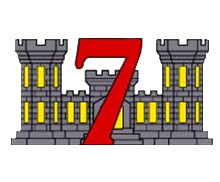 Unit: , 7th Engineer Support Battalion, 1st Marine Logistics Group, I Marine Expeditionary Force, Camp Pendleton, CA. 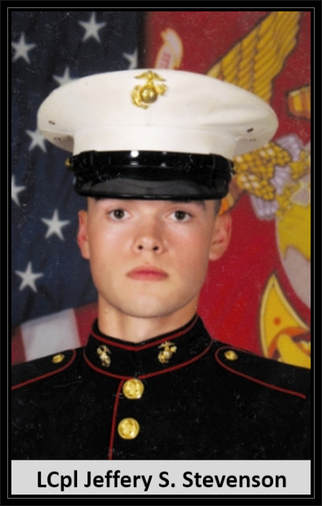 Birth: May 13, 1988, Stroudsburg, Monroe County, PA.
Lance Cpl. Jeffery Stevenson of Stillwater, New Jersey is a 2006 graduate of Kittatinny Regional High School and enlisted in the armed forces immediately following graduation. He may have been following in the footsteps of his older brother Robert who is a member of the United States Air Force. In reality, Jeffery joined the Marines with the hope of making his own path. He just wanted to do something different for himself. He seem to always have a desire to enlist as early as the seventh or eighth grade. He was always a solid student driven to do the right thing and he was proud of his country and felt everybody else should be to. Jeff spent his early childhood in Marshalls Creek, Pennsylvania. He was a loving, respectful son and a happy, smiling kid. He was very well read and always gave his point of view intelligently without becoming offensive. Though he was more more mature than most people are at his age he still enjoyed lifting weights, playing football with his brother, and playing video games and basketball with his friends. He wasn't afraid to get his hands dirty or just to go out and play and he loved the outdoors. He enjoyed building things and working as a mechanic. Upon finishing his tour of duty, Jeff had planned to get involved with electrical work or become a math teacher. He died while serving with the United States Marines in Iraq at age 20. STILLWATER - Lance Cpl. Jeffery S. Stevenson, USMC, 20, died Sunday, July 13, 2008, in Iraq. Born in Stroudsburg, Pa., Lance Cpl. Stevenson spent his early childhood in Marshalls Creek, Pa. He was a 2006 graduate of Kittatinny Regional High School and joined the U.S. Marine Corps six months after graduation. Lance Cpl. Stevenson was a USMC machinist with the 7th Engineers Support Battalion, 1st Marine Division, stationed in Camp Pendleton in San Diego, Calif. A family statement said he was "a loving, respectful son and a happy, smiling kid. Lance Cpl. Stevenson joined the Marines knowing full well what could happen, but he didn't let that stop him. When he wanted something, LCpl Stevenson did not let anything stand in his way." Lance Cpl. Stevenson is survived by his mother and father, Karen and Joe Solarino of Stillwater; his brother and best friend, Senior Airman Robert L. Stevenson, who is stationed at Ft. Warren Air Force Base in Cheyenne, Wyo. ; his sister-in-law, Brienne Stevenson, and his niece, Taylor Stevenson, also of Cheyenne; his maternal grandparents, Robert and Shirley Newton of Marshalls Creek; and many aunts, uncles and close cousins. Funeral services will be held 10 a.m. on Saturday at the First Presbyterian Church of Newton, 54 High St., Newton. Interment will follow in Stillwater Cemetery. Visitation will be held Friday from 3 to 5 and 7 to 9 p.m. at the Smith-McCracken Funeral Home, 63 High St., Newton.